Description -40° to +270°F (-40° to +132°C) temperature sensor in a stainless steel deep drawn tube with 20' of 2 conductor shielded cable. Description -40° to +270°F (-40° to +132°C) temperature sensor in a stainless steel deep drawn tube with 40' of 2 conductor shielded cable. Description -40° to +270°F (-40° to +132°C) temperature sensor in a stainless steel deep drawn tube with 60' of 2 conductor shielded cable. Description -40° to +248°F (-40° to +120°C) temperature sensor is a 100K thermistor mounted in an explosion proof housing providing Class 1 Division 2 Group A, B, C, D approval. Description -60° to +48°F (-51° to +9°C) temperature sensor in a stainless steel deep drawn tube with 20' of 2 conductor shielded cable. Description -60° to +48°F (-51° to +9°C) temperature sensor in a stainless steel deep drawn tube with 40' of 2 conductor shielded cable. Description Thin walled deep drawn copper tube 2¾" long with an 0.425" outside diameter filled with heat transfer grease. Designed to hold a MCS-T100 temperature sensor. Description A tube filled with heat transfer grease that has been soldered onto a ¼" brass hex fitting with NPT thread. Total length is 2½". Description A tube filled with heat transfer grease that has been soldered onto a ¼" brass hex fitting with NPT thread. Total length is 3.68". Description A tube filled with heat transfer grease that has been soldered onto a ½" brass hex fitting with NPT thread. Total length is 2¾". Description A tube filled with heat transfer grease that has been soldered onto a ½" brass hex fitting with NPT thread. Total length is 4". Description A tube filled with heat transfer grease that has been soldered onto a ½" double male brass hex fitting with NPT thread. Total length is 3½". Description A MCS-TUBE filled with heat transfer grease that has been soldered onto a ½" brass hex fitting with NPT thread. Total length is 2¾". Description Steel reinforced epoxy putty stick. Description 32° to +158°F (0° to +70°C) temperature range for four MCS-T100-20 sensors that all connect to our five input board that communicates with the MCS-Magnum to average the four sensors. Description -22° to +125°F (-30° to +51.6°C) temperature sensor in nickel plated copper deep drawn tube with 20' of 3 conductor shielded cable. Description -76° to +32°F (-60° to 0°C) temperature sensor in nickel plated copper deep drawn tube with 20' of 3 conductor shielded cable. Description 32° to +250°F (0° to +121.1°C) temperature sensor in nickel plated copper deep drawn tube with 20' of 3 conductor shielded cable. Description An MCS-T100 temperature sensor with an air supply bracket. Mounting base is 2" x 2" and requires a minimum of 2.25" for inserting into air duct. Comes with 20' of 2 conductor shielded cable. Description An MCS-T100 temperature sensor with an air supply bracket. Mounting base is 2" x 2" and requires a minimum of 2.25" for inserting into air duct. Comes with 40' of 2 conductor shielded cable. Description An MCS-T100 temperature sensor with an air supply bracket. Mounting base is 2" x 2" and requires a minimum of 2.25" for inserting into air duct. Comes with 60' of 2 conductor shielded cable. Description Combination humidity and ambient temperature sensor board packaged in a plastic housing 4.30"w x 6.50"l x 2.25"h.
Description Combination humidity and ambient temperature sensor board packaged in a plastic housing 2.82"w x 2.35"l x 7.98"h.
Description 300:0.2 current transformer with circuitry to convert induced ac voltage into a 0-5vdc output voltage. Wire hole diameter: 1.00"
Description 500:0.2 current transformer with circuitry to convert induced ac voltage into a 0-5vdc output voltage. Wire hole diameter: 1.56"
Description 750:0.2 current transformer with circuitry to convert induced ac voltage into a 0-5vdc output voltage. Wire hole diameter: 2.05"
Description 1500:0.2 current transformer with circuitry to convert induced ac voltage into a 0-5vdc output voltage. Wire hole diameter: 4.25"
Description The MCS-POWERMETER monitors the voltage, current, power, energy, and many other electrical parameters on single and three-phase electrical systems. Description The MCS-POWERMETER monitors the voltage, current, power, energy, and many other electrical parameters on single and three-phase electrical systems. Kit includes an MCS-MODBUS-I/O allows the MCS-MAGNUM to communicate to the MCS-POWERMETER as a Modbus slave device. Description 0 to 150 absolute psi gage pressure transducer with ¼" SAE female flare fitting and Schrader valve. Supplied with a packard connector and 20' of 3 wire shielded cable. Description 0 to 150 absolute psi gage pressure transducer with ¼" SAE female flare fitting and Schrader valve. Supplied with a packard connector and 40' of 3 wire shielded cable. Description 0 to 150 absolute psi gage pressure transducer with ¼" SAE female flare fitting and Schrader valve. Supplied with a packard connector and 60' of 3 wire shielded cable. Description 0 to 200 psi gage pressure transducer with ¼" SAE female flare fitting and Schrader valve. Supplied with a packard connector and 20' of 3 wire shielded cable. Description 0 to 200 psi gage pressure transducer with ¼" SAE female flare fitting and Schrader valve. Supplied with a packard connector and 40' of 3 wire shielded cable. Description 0 to 500 psi gage pressure transducer with ¼" SAE female flare fitting and Schrader valve. Supplied with a packard connector and 20' of 3 wire shielded cable. Description 0 to 500 psi gage pressure transducer with ¼" SAE female flare fitting and Schrader valve. Supplied with a packard connector and 40' of 3 wire shielded cable. Description 0 to 500 psi gage pressure transducer with ¼" SAE female flare fitting and Schrader valve. Supplied with a packard connector and 60' of 3 wire shielded cable. Description 0 to 667 psi absolute pressure transducer with ¼" SAE female flare fitting and Schrader valve. Supplied with a packard connector and 20' of 3 wire shielded cable. Description 0 to 667 psi absolute pressure transducer with ¼" SAE female flare fitting and Schrader valve. Supplied with a packard connector and 40' of 3 wire shielded cable. Description 0 to 667 psi absolute pressure transducer with ¼" SAE female flare fitting and Schrader valve. Supplied with a packard connector and 60' of 3 wire shielded cable. Description Packard connector with 20' 3 wire shielded cable for MCS pressure transducers. Description Packard connector with 40' 3 wire shielded cable for MCS pressure transducers. Description Packard connector with 60' 3 wire shielded cable for MCS pressure transducers. Description 100 PSI pressure transducer that is an economic and durable option for dealing with high-pressure industrial applications where an explosion proof transducer is required. Description 0 to 200 psi gage pressure transducer with ¼" SAE female flare fitting on 316L stainless steel wetted explosion proof housing. Description 500 PSI pressure transducer that is an economic and durable option for dealing with high-pressure industrial applications where an explosion proof transducer is required. Description 667 PSI pressure transducer that is an economic and durable option for dealing with high-pressure industrial applications where an explosion proof transducer is required. 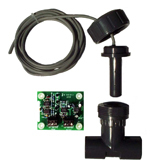 Description 0-50 PSI differential pressure transducer that is an economic and durable option for dealing with differential-pressure industrial applications. Description The MCS-CONDUCTIVITY is a conductivity-to-voltage transducer which takes its input from a carbon electrode probe in a fluid stream and outputs a corresponding voltage to a MCS-8 micro controller. Description The MCS-VOLTAGE-1PH board accepts AC voltage inputs of 200vac to 600vac and generates a DC voltage output of 1.42vdc to 4.91vdc to a sensor input of an MCS-MAGNUM micro controller that is programmed to convert this signal to the corresponding AC voltage. Description The MCS-VOLTAGE-3PH board accepts AC voltage inputs of 200vac to 600vac and generates three separate DC voltage outputs of 1.42vdc to 4.91vdc to a sensor input of an MCS-MAGNUM micro controller that is programmed to convert this signal to the corresponding AC voltage. 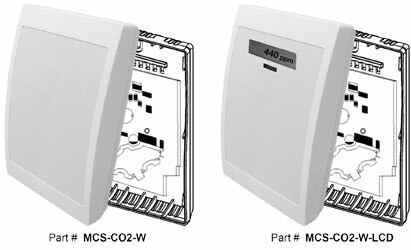 Description The MCS-CO2-W measures the CO2 in a range of 0 to 2,000 ppm with an output of 0-5 VDC. Description Carbon dioxide wall mount transmitter w/ LCD of CO2 level 4 Digits, 7 segments LCD with ppm indicator. Description The MCS-CO2-D measures the CO2 in a range of 0 to 2,000 ppm with an output of 0-5 VDC.